Summary: This walk follows the information signs of the Grassington Moor Lead Mining Trail as set out by the Yorkshire Dales Millennium Trust with funding support from the European Community, Yorkshire Dales Millennium Trust, English Heritage and Yorkshire Dales National Park Authority. 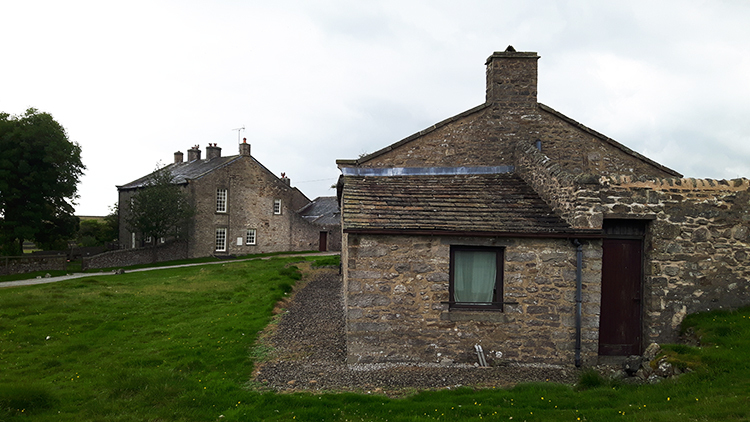 It is a short, pleasant walk across low moorland and with no significant climbing though the walk from Yarnbury to the Smelt Mill Chimney is on a gradual incline. 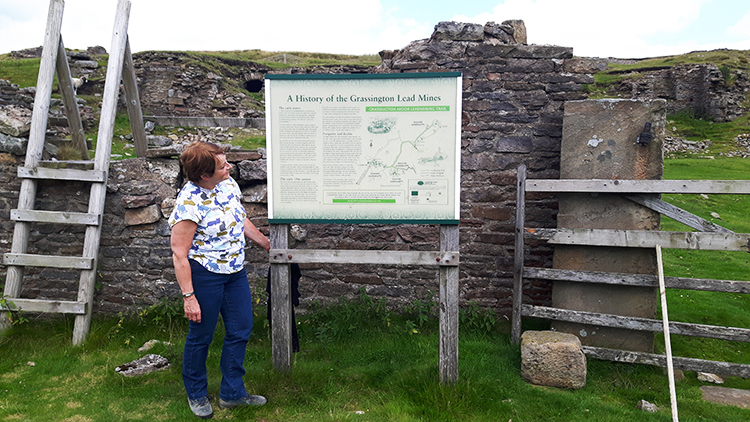 Overall this is a walk to enjoy at leisure while reading the notice boards and imagining what life was like on the moors during the active times of the lead mining industry which was most prosperous between 1821 and 1861 when over 20,000 tons of lead was extracted. Oh, the walk is not just about lead mining. The views are gorgeous too. 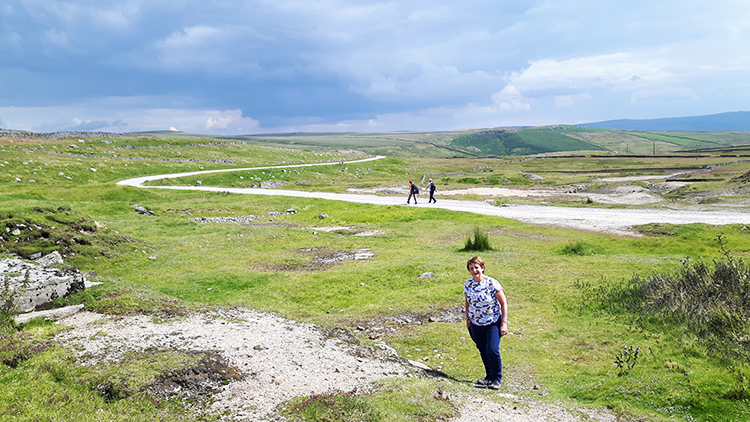 The Walk: My wife Lil and I were out for a leisurely day travelling around the Pateley Bridge and Grassington area, mainly to browse in the shops and take a light lunch in a cafe. 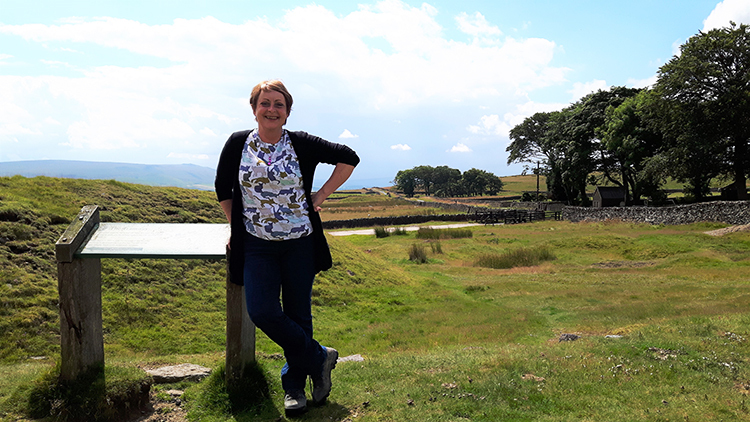 After said light lunch in Grassington though and with the sun shining down on a lovely early September day I suggested a short walk to see the lead mines nearby. We were not dressed for major hiking but this interesting option of a recreational walk was appropriate. Lil said yes to the idea so off we went. Having parked up at the end of the road in Yarnbury, a settlement which is most famously associated with a hard to find prehistoric Henge and latterly by the lead mines of our quest during this walk, Lil and I were soon on our way. The sunshine we had enjoyed all day continued to beam down but we did notice clouds sweeping across from the south-west and filling the sky. With showers promised for later on in the day we pressed on from near Yarnbury House which possibly served as the Weigh House for extracted lead ore and from beside the terminal point of the tramway which took lead from the moor to Grassington village, the probable centre for the distributors of lead to the mines customers. 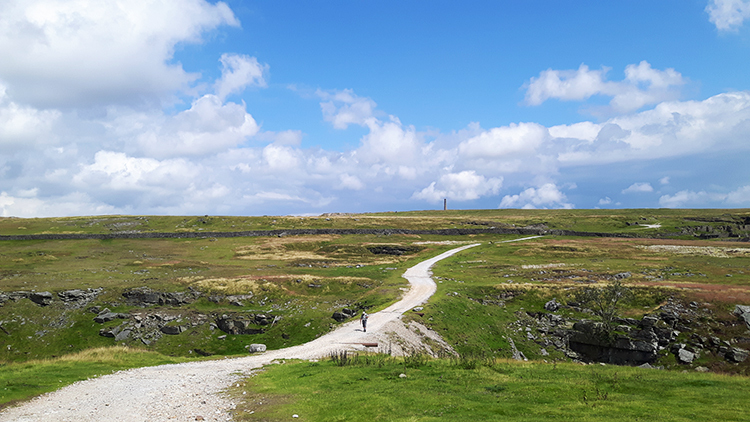 Lil and I followed the unmade vehicular lane leading on a meandering north-east course to the heights of Grassington Moor and to the hive of the mining activity at the smelt mills. Note there are sites of disused mine shafts scattered all over the place on this walk so take care if you stray from the trail. 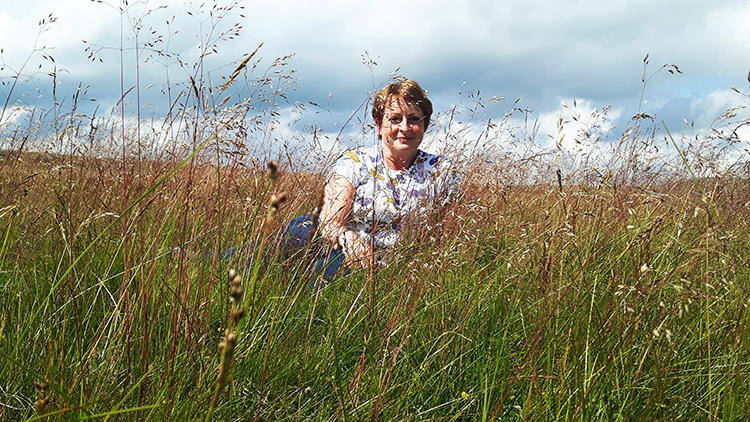 We did not venture too far off course but sometimes swathes of meadow grasses blowing in the freshening breeze drew us across to dwell in their beauty. Nature is reclaiming the moor now the miners have gone and it is a lovely moor to enjoy. We continued along the road, following it on a very gentle uphill climb with the Smelting Mill Chimney providing a permanent bearing. 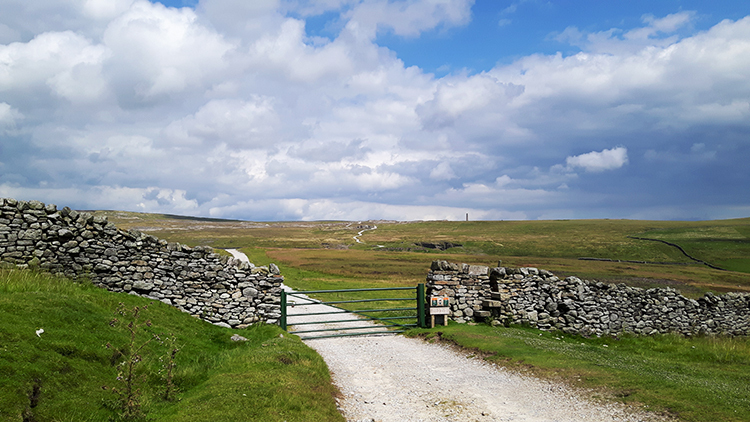 The chimney is an icon of Grassington Moor, saved from undue demolition when the mines closed and therefore standing proudly on top of the moor. Soon the trail took us across the line of Duke's Water Course. The cut, running from west to east provided water for the Yarnbury reservoir which powered a water wheel on the dressing floor of the Wheel House. 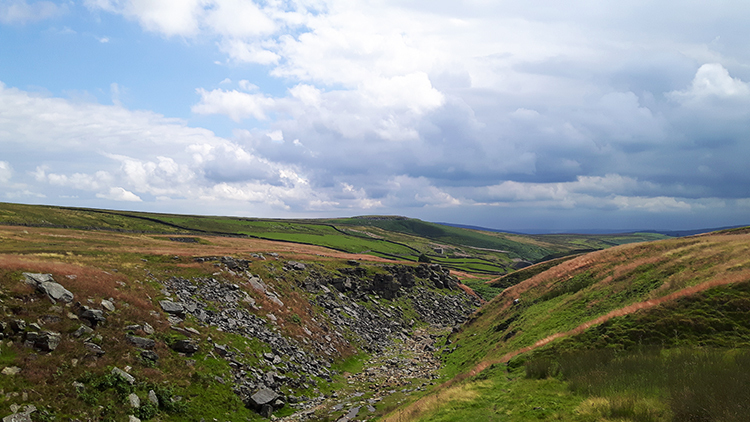 It collected water from the dams at Blea Beck and took its name from the Duke of Devonshire who owned the moors during the age of the mines. 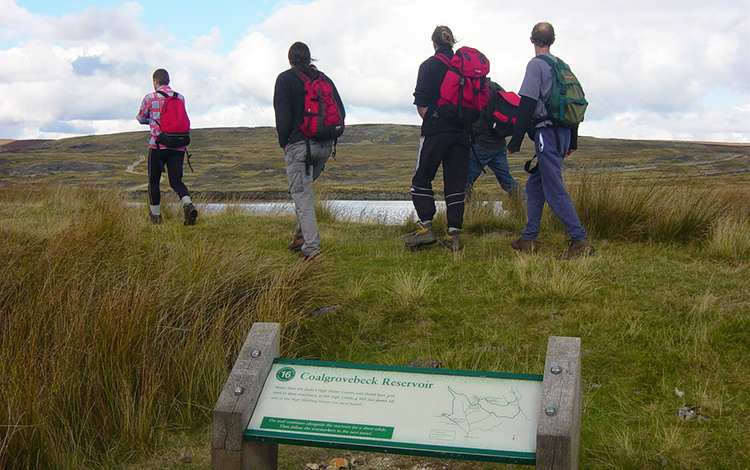 After crossing over the artificial water course the trail swept around from north to east and led us to the site of the Wheel House. 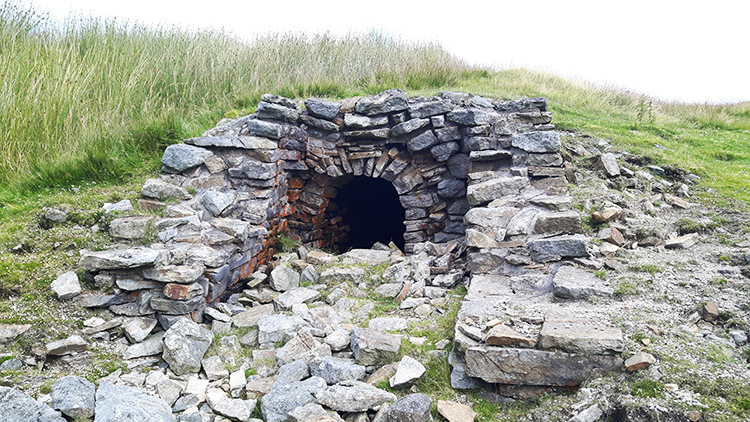 The site of the derelict building directly above the old wheel house which would have operated the pumps in the nearby mine workings is one of the best preserved of all the structures on the mining trail. This is probably so because it was used as a working site for washing and precessing when trying to recover barytes for the chemical industry as late as the 1960's. I find it hard to imagine there were still post lead mining activities going on then but apparently there were. Just above the Wheel House and associated buildings we came to the low outlet of the smelt mine flue. he line of it led true and straight to the foot of the chimney. In places on the line of the flue the top was broken, perhaps by design of the trail designers, to show the build of the flues. 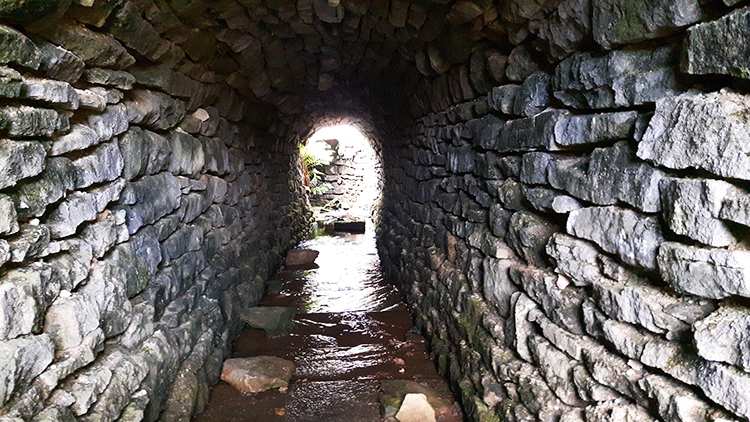 And impressive it is, with internal walls and arching that any dry stone waller would be proud of. The flue was clearly built to last. And to this day it still serves as a water channel for drainage of the moor. Water trickled down and I imagined a forced gush from the smelt to remove the galena (lead ore) from the rocks of the moor. Near the line of the main flue we came to the site of the condenser house. Here a sign explained "When lead is smelted, some escapes as tiny particles called fume in the waste gases from the furnaces. Condenser Houses were built to slow down these waste gases and make it easier to collect the lead fume for re-smelting". Nothing valuable went to waste then. Continuing on we headed up to the site of the chimney and just as the skies darkened. The rain we had been promised was surely on its way and possibly in the form of a heavy storm. "I hope we get finished before the heavens break" said I. Lil agreed, we were not prepared for getting wet. Neither of us had a coat on hand. 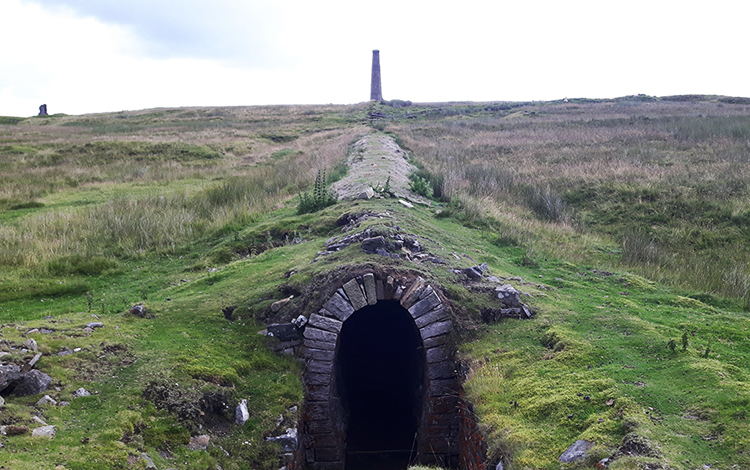 Still we got to the chimney in the dry and across to the sites of High Grinding Mill, High Winding House and Coalgrovebeck Reservoir which served the mill and the winding house. We did not linger by these sites long though as a trickle of water from cloud above swiftly turned into a deluge. The sky over Grassington Moor went dark very quickly. 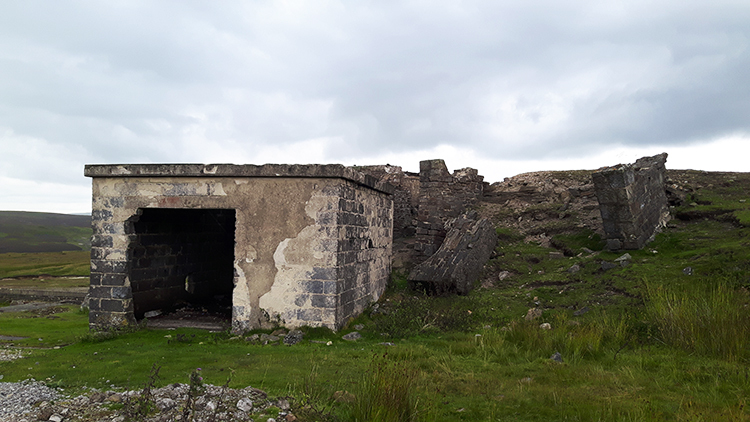 We scampered as quickly as we could from the site of the reservoir into a derelict square building which looked of a later age than the disused mining buildings we had visited thus far. The breeze blocks which formed the ugly flat roofed housing gave that away though we were appreciated there was a roof on it. No other building at our disposal did and we stood inside it for a good fifteen minutes while the rainstorm blew over the moor from south-west to north-east. More square concrete pads near our temporary shelter suggested they were what remains of a disused chemical works, which may or may not have had a use during the second world war. Not sure about that, perhaps they were linked to the later mineral workings of the 1960's. With the rain stopped but with a now gray filled sky Lil and I headed back to the completion of the trail with more haste than earlier. 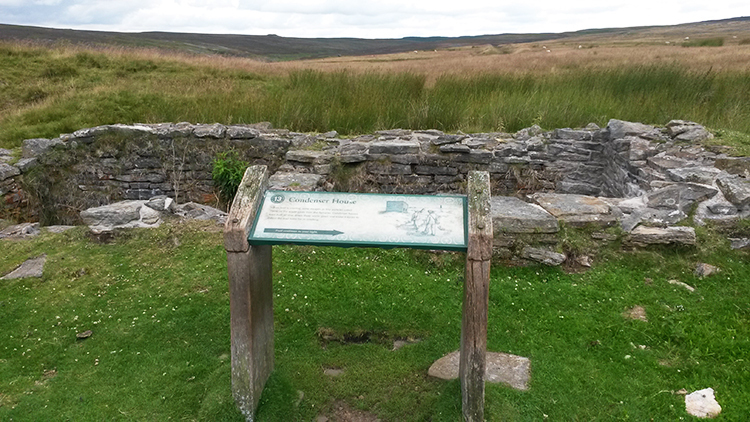 We had enjoyed an interesting walk on Grassington Moor which began in bright conditions and ended in gloom. Much like the mining industry in this place then. Come along and look for yourself on a good day if you can, it is well worth it.